Bringing a new puppy into the home is an exciting time for all involved. Life will never be the same. Some pups adapt to the changes better than others. You can help your pup make a smooth transition from life with his siblings and breeder into his new family home with a little thought and advance planning. You’ve waited for this day for a long time. Come prepared. If you are picking up your pup at the breeder’s, bring along a plastic kennel crate for the ride home, fleece fabric blanket, small adjustable collar, leash, a chew toy - and if it will be a long ride on a hot day, a container of water and a small dish. Should your pup be arriving at an airport, bring along all of the items mentioned, except, of course, the crate. You may want to include paper towels in case the kennel needs cleaning out and a wash cloth to clean off pup, if needed. At last, you are on your way home with your new puppy. It is normal for young puppies to cry when they are taken away from their siblings and familiar surroundings. Most puppies will settle down - usually within 30 minutes or less. Until your pup is fully immunized, avoid taking him to public rest areas, gas stations, restaurants, parks, boarding kennels, obedience class, pet supply stores or other places where dogs may have been. These public areas can infect your puppy with serious illnesses - such as provirus, distemper, infectious canine hepatitis or parasites, among others things. Be cautious of direct contact with any unfamiliar, ill or unvaccinated dogs. 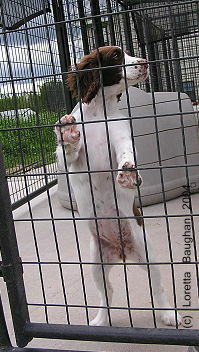 When visiting a veterinarian clinic, either hold your puppy or keep it in a kennel crate. Even if your breeder has administered a puppy vaccination to your pup, he could still be susceptible to these infectious diseases as puppy immune systems develop at differing rates. So it is prudent to be cautious - at least until your pup has completed its series of puppy immunizations. As they say… "an ounce of prevention"… is wise advice. Most puppies like to chew on things. They are cutting their teeth, so this behavior could last up until about the age of six months. When pup may try to chew on something he shouldn’t, divert his attention to a suitable chew toy or take him out for a walk. At this age, undesirable behaviors can easily become habitual, unless you are prepared to step in and direct his interest to another, more suitable activity. Just as with infants or toddlers, it is a good idea to puppy proof your home or any other area your puppy may have access to. Watch out for electrical cords as pups will try to chew on them. If there are children in the home, be sure they keep toys with small parts and crayons picked up and away from the pup. Wastebaskets and garbage may smell "good" to pup and invite investigation... and tasting. Is there a cat in your household? To a pup, the litter box may seem like a "treat" box. Keep the litter box out of reach - on top of the dryer or behind a closed door may be best. Don’t forget to keep household cleaners, sponges, pens, pencils, shoes… the TV remote control… out of pup’s reach. Don’t overlook puppy proofing your yard, as well. Puppies learn about their world by sound, sight, smell, touch and taste. So it is only natural for them to put these senses to use when exploring the outdoors. Pups will chase birds, rabbits, squirrels... cats... maybe even into the road. Some plants found in your yard and garden compost may make a pup sick. Be aware of drips from vehicles in the driveway or garage - especially antifreeze - as it has a sweet taste and only takes a very small amount to kill a pup. Garages, sheds or other out-buildings can contain all sorts of hazards. Keep things that a curious pup shouldn’t have access to, safely out of reach. Many pups will pick up sticks, stones or other objects - and even try to eat them. Some pups have been known to consume rocks as large as golf balls. This can result in intestinal blockages requiring surgery… or will cause death. That is why it is important for puppies to always be under adult supervision. They simply don’t comprehend dangers and consequences. That is their owner’s responsibility. Of course, it may not be practical to remove all of the stones from your yard’s landscaping. Instead, rely on close supervision - or you may consider installing a kennel run for him in your yard. This is a good idea as pups require plenty of exercise. They enjoy being outdoors and the contained area will help to keep him safe - while giving him the freedom to enjoy a sunny afternoon in the yard. It is a good idea to use a kennel crate to secure your pup when you are away, at night, while traveling - or at any time when you are unable to supervise him. A pup left to his own devices and running loose in a house will surely get into some sort of mischief. A crate protects both the puppy and your home. Another benefit is that most kennel trained pups will not soil in their kennel. This is a great aid during the housetraining process. Just be sure to give him the opportunity to relieve himself before being kenneled and take him outside immediately after letting him out of the kennel - each and every time. It is a simple task to crate train a pup. Just take a small treat, get pup’s attention focused on you, then toss the treat into the crate and say, "kennel". Pup will run right in. He will associate his kennel with something good and will soon run in on command without the incentive of a treat. Some people misguidedly believe that putting a pup or a dog in a kennel crate or an outdoor kennel run is cruel. Not so, at all. A kennel crate or enclosed run in the yard with adequate shade, fresh water and an igloo or dog house for shelter is part of being a responsible pet owner. It enables the owner to focus on preventing a problem - rather than trying to deal with a situation after pup has acquired a bad habit - such as chewing on electrical cords or eating stones. 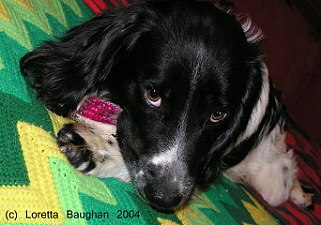 Prevention is a much easier and far less stressful route - for you and pup. In the puppy's mind, the kennel crate will come to represent "his" space. You may even find that your puppy will go into his crate on his own if he is overwhelmed or tired and take a nap. Puppies - and dogs in general - are able to learn best from repetition. So by establishing a daily routine for your puppy, you will help him to make the adjustment to his new home easier and provides a sense of security in knowing what to expect. Immediately upon awakening, when being released from his kennel crate and directly after eating or drinking, take pup outside to the area where you want him to relieve himself. Use a word: "potty", "hurry" - or whatever you wish to help pup associate a word with the activity. Soon, he will be running over to that spot all on his own. If an accident happens, do NOT rub his nose in it and yell. Doing so will not help in the potty training process and could cause the pup to become afraid of you, making the problem worse. Unless you catch him in the act, he won’t understand why you are upset with him. If you do catch him, just say, "No! ", pick him up and take him outside to where he should relieve himself. Be sure to praise the pup whenever he does do it correctly to reinforce the right behavior. Try to feed pup his evening meal before 8PM and avoid giving him water within a hour of bedtime. Do take him outside right before bed. Between the ages of eight to ten weeks old, he should be able to go through the night. "At this age, undesirable behaviors can easily become habitual, unless you are prepared to step in and direct his interest to another, more suitable activity." Puppies, by nature, are energetic and regardless of the breed, they require an adequate amount of daily exercise. This involves more than just a quick walk on a leash. Puppies need to have the opportunity to run and jump and play, unrestrained. They should be allowed a good romp three or four times a day. Remember, a tired puppy is a good puppy. Ask your breeder what kind of puppy food your puppy has been fed. Either continue with the same brand or, if you prefer to use something else, make it a gradual change, blending the new food with the old over a period of a few days. When you feed dry kibble, provide fresh water in a separate bowl. Feeding moistened food is not recommended as it will result in tarter build-up on pup’s teeth. I recommend feeding pup three times a day. A lot of the commercial treats have very poor nutritional value. And giving pup too many treats can cause a him to become a finicky eater - he may begin thinking that he would rather have them than eat his dinner. Try giving pup pieces of banana, small bits of carrot or apple. Don’t let pup have grapes as these are like poison to them, as is chocolate. Avoid rawhide chews as they have no nutritional value. Also, rawhides do not digest and can cause life-threatening intestinal blockages. Puppies love kids - and vice versa. Interaction between the two is good for both. They make great playmates. Socialization is not just the breeder’s responsibility. Yes, it is important that the breeder begins the process, but it is equally vital that the new owner continue to provide proper socialization opportunities through the age of three or four months. 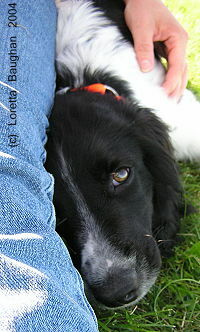 Inadequate socialization can result in a dog who is fearful. 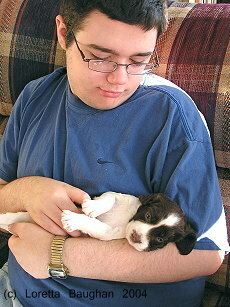 Playing with children and meeting new people during this period will enable the pup to develop a healthy personality. Young pups don’t know to watch out for feet. A pup can easily get stepped on or tripped over - and seriously injured. Children need to know not to run with or near the pup and to always watch out for him. Pups can be squirmy. There is so much to see and do! It is easy for them to wriggle free from little arms and possibly fall. Small children should not try to carry puppies. It really boils down to providing adult supervision and common sense. Get your children involved and teach them how to care for the pup. Perhaps they can assist with feeding or brushing the pup’s coat. Do set up some basic ground rules - which should include "no tug of war" and "do not chase" - especially if you plan for your pup to become your hunting companion. If the pup picks up something he shouldn’t, take it from him gently - never yank anything from his mouth. Limit retrieves to just a few each day in a hallway so as to discourage pup from becoming bored with retrieving. 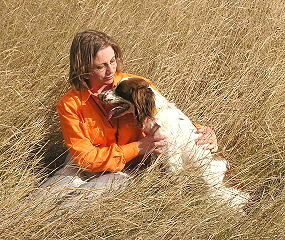 If you have training dummies for your gun dog pup, put them away after training. The pup should never be allowed to chew on these items nor play with them outside of training. Do continue your puppy’s immunizations according to the schedule your veterinarian recommends. Depending on your location, travel plans, whether you will be hunting or competing in various field, agility, obedience or other dog events - your vet should be informed so that he or she can best advise you on specific vaccines that may be needed. Consult your veterinarian on all health-related matters.